What is acute bronchitis? What are the symptoms of acute bronchitis? What are the signs and symptoms of chronic bronchitis? When should you see a doctor for chronic bronchitis? What is the treatment for chronic bronchitis? 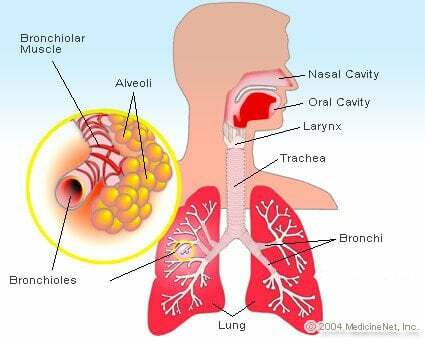 What medications treat chronic bronchitis? What are other medical treatments? What natural remedies treat chronic bronchitis symptoms? What are the complications of chronic bronchitis? What is the prognosis for chronic bronchitis? Can chronic bronchitis be prevented? Chronic bronchitis is defined as a cough that occurs every day with sputum production that lasts for at least 3 months, 2 years in a row. The major cause of chronic bronchitis is cigarette smoking; other causes are bronchial irritants, usually inhaled repeatedly by the affected person. Ideally, people should seek medical care before chronic bronchitis develops. Patient history and physical exams help diagnose chronic bronchitis, while other tests such as chest X-rays, pulmonary function tests, and CT imaging studies may also be used. Treatment of most people with chronic bronchitis is to quit cigarette smoking and avoid air-borne bronchial irritants; medical treatments include bronchodilators, steroids, and oxygen therapy. The major complications of chronic bronchitis are severe shortness of breath, COPD, respiratory failure, and an increased mortality rate. Risk factors for chronic bronchitis include smoking, exposure to airborne chemicals and secondhand smoke, dust, and other bronchial irritants. A majority of cases of chronic bronchitis can be prevented by not smoking and avoiding secondhand smoke. Avoidance of air-borne bronchial irritants, vaccinations, and asthma prevention may help prevent bouts of chronic bronchitis. Although the disease is chronic and progressive, patients that are diagnosed early before much bronchial damage occurs and who stop smoking (or avoid airborne dust, chemicals or other situations that lead to bronchial irritation) often have a good prognosis for many years. To potentially avoid developing chronic bronchitis, seek treatment for tobacco addiction and the occasional chronic cough (less than daily for 3 months). If you have chronic bronchitis seek care for severe dyspnea, cyanosis, and fever immediately. Bronchitis is a term that describes inflammation of the bronchial tubes (bronchi and the smaller branches termed bronchioles) that results in excessive secretions of mucus into the tubes, leading to tissue swelling that can narrow or close off bronchial tubes. Bronchial tubes extend from the trachea and terminate at the alveoli in the lungs. The bronchial system resembles an inverted tree and is sometimes termed the "bronchial tree." A few authors include the trachea and upper airway in the definition of bronchitis. There are two major types of bronchitis, acute and chronic. Chronic bronchitis differs from acute bronchitis in several ways, for example, pathology, progression of disease, major causes, treatments, and prognosis. Recurrent incidences of acute bronchitis are the first steps that can lead to developing chronic bronchitis, according to some doctors and researchers. Acute bronchitis is bronchitis that is short-lived. Acute bronchitis lasts about two weeks, and usually people recover with no permanent damage to the bronchial tree. Viruses such as influenza, respiratory syncytial virus (RSV), and rhinoviruses cause the majority of cases of acute bronchitis, while the remainder are caused by bacteria (for example, Mycoplasma, Pneumococcus) or short-term exposure to chemical irritants (for example, tobacco smoke, acid reflux, inhaled solvents). shortness of breath especially with exertion. Some people may cough up phlegm. Chronic bronchitis is defined as a cough that occurs every day with sputum production that lasts for at least 3 months, two years in a row. This definition was developed to help select uniform patient populations for research purposes, for example, to study medication therapies for treatment of chronic bronchitis. Many of the bronchi develop chronic inflammation with swelling and excess mucus production. The inflammation causes a change in the lining cells of the airways to varying degrees. Many cells that line the airway lose the function of their cilia (hair-like appendages that are capable of beating rapidly), and eventually the ciliated cells are lost. Cilia perform the function of moving particles and fluid (usually mucus) over the lining surface in such structures as the trachea, bronchial tubes, and nasal cavities to keep these hollow structures clear of particles and fluids. These ciliated cells that help in clearance of secretions are often replaced by so-called goblet cells. This group of cells secretes mucus into the airway. The warm moist environment of the airway along with the nutrients in the mucus is an excellent medium for growing bacteria. The mucus often becomes infected and discolored from the bacterial overgrowth and the body's inflammatory response to it. The inflammation, swelling, and mucus frequently and significantly inhibit the airflow to and from the lung alveoli by narrowing and partially obstructing the bronchi and bronchioles. The muscles that surround the some of the airways can be stimulated by this airway irritation. This muscular spasm also known as bronchospasm can result in further airway narrowing. With long-standing inflammation, as can be seen in chronic bronchitis, this muscular spasm and inflammation results in a fixed, nonreversible narrowing of the airway and the condition is termed chronic obstructive pulmonary disease (COPD). Chronic coughing develops as the body attempts to open and clear the bronchial airways of particles and mucus or as an overreaction to ongoing inflammation. Chronic bronchitis can be a progressive disease; symptoms (listed below) increase over time. Some NIH investigators consider chronic bronchitis a type of COPD. COPD also includes the entities of emphysema, chronic bronchitis, and chronic asthma. These conditions are not always separable and patients often have components of each. In the case of chronic bronchitis, the fixed airway obstruction, airway inflammation, and retained secretions can result in a mismatch of blood flow and airflow in the lungs. This can impair oxygenation of the blood as well as removal of the waste product, carbon dioxide. Although people of any age can develop chronic bronchitis, the majority of people diagnosed with the disease are 45 years of age or older. Cough and sputum production are the most common symptoms. They usually last for at least 3 months and occur daily. The intensity of coughing and the amount and frequency of sputum production vary from patient to patient. Sputum may be clear, yellowish, greenish, or occasionally, blood-tinged. Since cigarette smoke is the most common cause for chronic bronchitis, it should not be surprising that the most common presentation is so called smoker's cough. This is characterized by a cough that tends to be worse upon arising and is often productive of discolored mucus in the early part of the day. As the day progresses, less mucus is produced. Shortness of breath (dyspnea) gradually increases with the severity of the disease. Usually, people with chronic bronchitis get short of breath with activity and begin coughing; dyspnea at rest usually signals that COPD or emphysema has developed. Wheezing (a coarse whistling sound produced when airways are partially obstructed) often occurs. Severe coughing that causes chest discomfort or chest pain. Cyanosis (bluish/grayish skin coloration) may develop in people with advanced COPD. Fever may indicate a secondary viral or bacterial lung infection. There are many causes of chronic bronchitis, but the main cause is cigarette smoke. Statistics from the US Centers for Disease Control and Prevention (CDC) suggest that about 49% of smokers develop chronic bronchitis and 24% develop emphysema/COPD. gastric reflux (by inhalation of gastric contents). Ideally, a person should seek medical care before chronic bronchitis develops. It is reasonable for people to seek care for tobacco addiction and the occasional chronic cough (occurring less than daily for 3 months) and to get medical help to potentially avoid developing chronic bronchitis. However, any daily cough that lasts for at least 3 months in a person should be investigated by a physician. If a person develops chronic (3 months or longer) cough, difficulty breathing, sputum production, and other symptoms, it may represent the first bout of chronic bronchitis. Thus, seeking medical care may help slow or prevent the usual progression of the disease. If a person with diagnosed chronic bronchitis (or COPD or emphysema) develops severe problems with breathing, cyanosis ,or fever, they should seek emergency medical care immediately. Health care professionals diagnose chronic bronchitis based on a person's medical history, physical exam, and diagnostic tests. A history of a daily productive (sputum production) cough that lasts at least 3 months, especially if has occurred two years in a row, fits the criteria for a clinical diagnosis of chronic bronchitis. The physical examination often allows health-care professionals to hear wheezes and a prolongation of the exhalation of breathing, which are signs of airflow obstruction. A chest X-ray is often performed to help rule out other lung problems (for example, pneumonia, bronchial obstructions). Additional tests such as a complete blood count (CBC), arterial blood gas measurements, CT scan of the chest, and pulmonary function tests are often done to characterize the structure and function of the lungs and to help exclude other conditions (for example, lung cancer, tuberculosis, lung infections). Often a pulmonologist (a physician with specialized training in the management of lung diseases) can help diagnose and treat chronic bronchitis. For the majority of cases, the initial treatment is simple to prescribe but frequently ignored or rejected by the patient – stop smoking cigarettes and avoid second-hand tobacco smoke. People should be encouraged in every way to cease smoking, as continuation will only cause further lung damage. Similarly, blocking or removing other underlying causes of repeated bronchial irritation (for example, exposure to chemical fumes) is a treatment goal. Half of patients with chronic bronchitis who smoke will no longer cough after 1 month of smoking cessation. Two major classes of medications are used to treat chronic bronchitis, bronchodilators, and steroids. Bronchodilators (for example, albuterol [Vent Olin, Proventil, AccuNeb, Vospire, ProAir], metaproterenol [Alupent], formoterol [Foradil],salmeterol [Serevent]) work by relaxing the smooth muscles that encircle the bronchi, which allows the inner airways to expand. Anticholinergic drugs also can act as bronchodilators, including tiotropium (Spiriva) and ipratropium (Atrovent). Steroids (for example, prednisone, methylprednisolone [Medrol, Depo-Medrol]) reduce the inflammatory reaction and thus decrease the bronchial swelling and secretions that in turn allows better airflow because of reduced airway obstruction. Often inhaled steroids are administered since they have fewer side effects than systemic (oral) steroids. Examples include budesonide (Pulmicort), fluticasone (Flovent), beclomethasone (Qvar), and mometasone (Asmanex). Combination therapy with both steroids and bronchodilators is often utilized. These include fluticasone/salmeterol (Advair), budesonide/formoterol (Symbicort), and mometasone/formoterol (Dulera). PDE4 inhibitors are a class of anti-inflammatory agents for certain exacerbations of COPD. They are primarily for exacerbations that involve excessive bronchitis and mucus production. There is currently only one agent available called roflumilast (Daliresp), a pill taken once per day. Of course, if a culture is obtained, directed therapy at the specific offending organism is always best. Over-the-counter (OTC) cough suppressants such as dextromethorphan (for example, Pertussin, Vicks 44 or Benylin) may be helpful in reducing cough symptoms. OTC preparations with guaifenesin (for example, Robitussin or Mucinex) may make patients feel more comfortable but there is no scientific evidence that it helps mucus to become less viscous. What are other treatments for chronic bronchitis? Pulmonary rehabilitation is another treatment method that combines education and graded physical exercise. The education portion often includes smoking cessation techniques and the relationship of tobacco use to symptoms. Breathing techniques can be very helpful in overcoming the anxiety and discomfort of exacerbations. When chronic bronchitis is severe, airflow and blood flow may not move appropriately through the lungs. It is crucial for lung function that airflow and blood flow to the lung are precisely matched. When they are not, drops in oxygen and increases in carbon dioxide can result with profound negative consequences. Supplemental oxygen therapy may be an integral part of treatment. Often it is required with activity and sleep. Patients with severe disease may benefit from purchasing a small finger oximeter for monitoring blood oxygen levels at rest and with activity. Certain "home remedies" may ease the symptoms of chronic bronchitis. One of the lessons of pulmonary rehabilitation is to instruct patients on the proper path for air to follow. This involves breathing in through the nose so that the air is moistened, cleansed, and warmed by the function of the upper airways (sinuses). Air is than expelled through the mouth and in some cases with pursed lips to help optimize the lung's function. Cold air often aggravates coughing and difficulty breathing, so avoiding cold air or wearing a cold-air mask (such as a ski mask or face scarf) may help when in cold environments. Dry air also aggravates coughing so warm, humidified air may help by reducing coughing and also may allow mucus to flow more freely, which may result in better clearing of the bronchial airways and less blockage by viscous mucus. Alternative treatments have been suggested by some researchers with little or no evidence of any benefit; and some may even be harmful (for example, herbal teas, high doses of vitamin C, South African geranium herb, eucalyptus oil inhalation therapy, and many others). Check with your doctor or other health-care professional before using any of these remedies or products. high mortality (death) rate (COPD is the fourth leading cause of death in the United States). Although the disease is chronic and progressive, affected individuals that are diagnosed early before much bronchial damage occurs stop smoking (or avoid airborne dust, chemicals, or other situations that lead to bronchial irritation), they often have a good prognosis for many years. Approximately half of smokers with chronic bronchitis will stop coughing after 1 month of smoking cessation. Most patients will no longer cough with continued abstinence from smoking. If airflow obstruction has occurred, this can improve but the improvement level depends on the duration of injury and the compliance with therapy. Obviously, the more impaired patients will have a lesser recovery of lung function. Conversely, those individuals that have continued bronchial irritation have only a fair to poor prognosis, since repeated bouts with the disease usually get worse, with affected individuals having more frequent incidents of coughing and dyspnea over time and further progression of lung function abnormalities. The majority of instances of chronic bronchitis can be prevented by not smoking and avoiding second-hand smoke. Flu and pneumococcal vaccines can help prevent repeated infections that may lead to the disease. Certain industries (for example, chemical, textile, and farm workers) are often associated with air-borne chemicals and dust; avoiding air-borne chemicals and dust with appropriate masks may prevent or reduce the individual's chance of developing chronic bronchitis. Good control of asthma may prevent chronic bronchitis from developing. The genetic predisposition to chronic bronchitis is not currently preventable. Fayyaz, J, MD. "Bronchitis." Medscape. Updated: Feb 09, 2017.